The KSLV -1 launcher stands on the launch pad at Khrunichev on Oct. 24, 2012. The third attempt to launch the rocket will take place some time no earlier than Jan. 30, 2013. The first two tries failed. PARIS — South Korea's KSLV-1, or Naro, rocket will make its third attempt to reach orbit in a launch scheduled between Jan. 30 and Feb. 8, Korea's Ministry of Education, Science and Technology said Jan. 16. The vehicle, with a Russian-built first stage and a Korean second stage, failed in its first two launch attempts in 2009 and 2010, and the most recent launch attempt has been delayed since October because of two unrelated issues. The failure of a hydraulic motor governing the second-stage engine's thrust vector control was the reason for the latest delay. The ministry said in a Jan. 16 statement that the suspect part has been replaced. The October launch had been canceled because of a leak in the first stage's helium pressurization unit. Moscow-based Khrunichev State Research and Production Space Center has provided the rocket's first stage and its RD-151 engine, which is a modified, less-powerful version of one of the engines Khrunichev plans to use for Russia's Angara rocket, now in development. The ministry said the Korean government, through the Korea Aerospace Research Institute, has invested 529 billion Korean won ($479 million) into the Naro vehicle since development began, out of a total allocation of more than 1.5 trillion won dedicated to the vehicle through 2021. 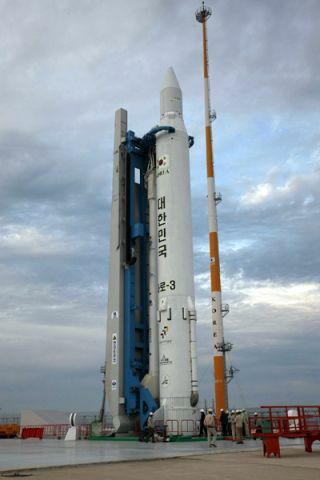 A Korean government research satellite, the 100-kilogram STSAT-2C, is the intended passenger on the launch.